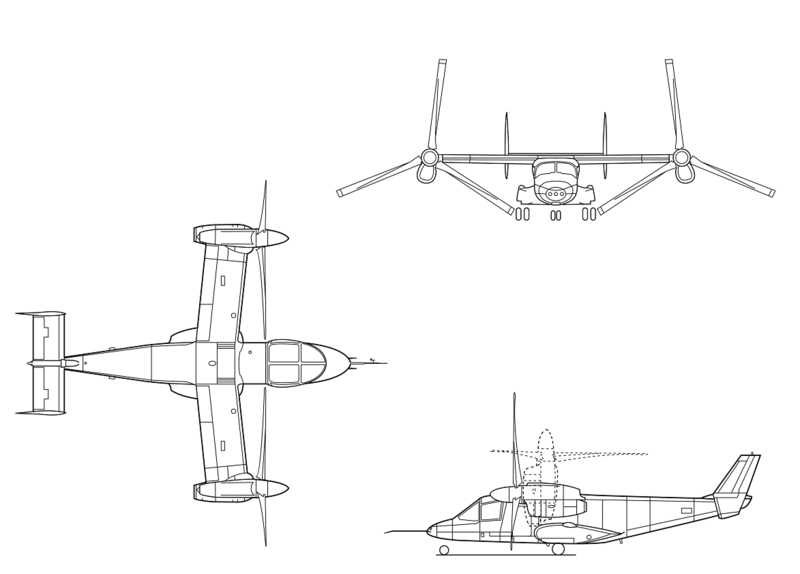 Well, first of all, the tiltrotor design is not exactly new. Combining the benefits of vertical takeoff capability offered by helicopters with the speed of conventional fixed wing aircraft, the tiltrotor design first appeared in the late ’40s, when the helicopter was still in its infancy.The United States Air Force and the United States Army joined to fund a research program, a program that would later lead to the development of the Bell XV-3. 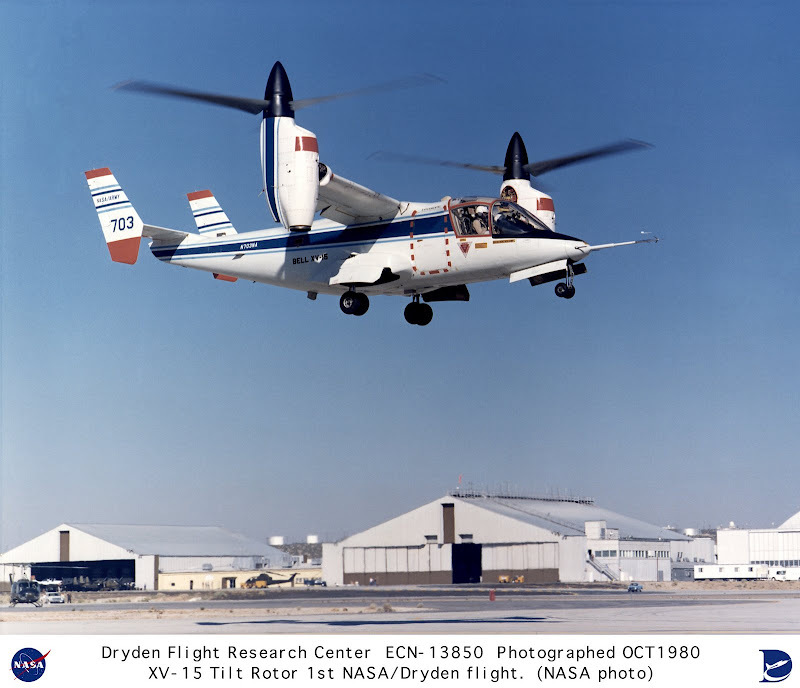 The Bell XV-3 was the first aircraft to demonstrate the tiltrotor concept. Tiltrotors are known as convertiplanes, in other words a fixed-wing aircraft capable of vertical take-off and landing. 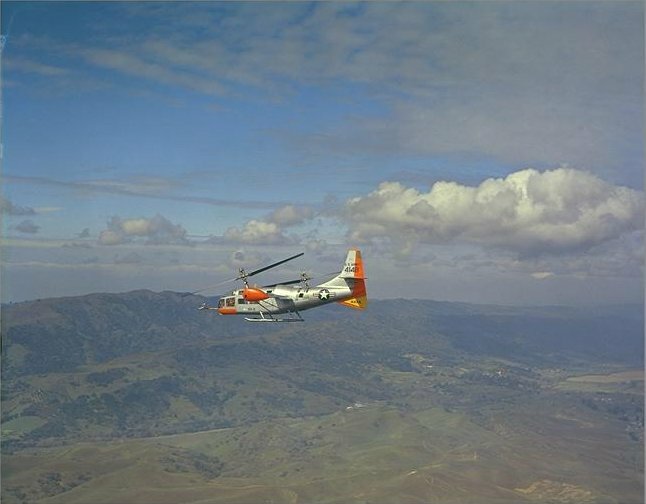 Most convertiplane ideas revolved around moving the entire wing to achieve the lift necessary for vertical flight, but the Bell XV-3 was the first to use wingtip rotor assemblies that could tilt 90 degrees from vertical to horizontal. The idea was simple enough: take one engine, stick it inside the fuselage, take two drive shafts from this engine and connect them with proppellers mounted towards the wingtip. These proppellers would tilt from horizontal to vertical… and presto, you have an aircraft capable of taking off on the vertical and reach reasonable speed while horizontal. And because those rotors were designed to tilt… they called it a tiltrotor. Obviously! The XV-3 flew for the first time on 11 August 1955. Between 1958 and 1962 this amazing aircraft accomplished 110 transitions from helicopter to airplane mode and vice versa. But, after 250 flights and some 130 flight hours, the Bell XV-3 was “retired”. It proved that the tiltrotor concept was viable and resulted in an enormous amount of information that was to be used for another prototype, the father of today’s Osprey, the Bell XV-15. After a series of incidents with the XV-3 prototypes it was concluded that a new solution was needed in order to make the tiltrotor aircraft a viable solution for military purposes. The problem XV-3 encountered reffered to the engine mounted inside the fuselage. This meant that very long drive shafts were needed, which produced a lot of vibration, as well a complex mechanism to allow for that transfer of power as well as tilt rotors 90 degrees. The Bell XV-15 came with a revolutionary idea at that time: why not make the entire engine tilt, with propeller and drive shaft and anything in between? The normal path for power was directly from the engine into a speed-reduction gearbox and into the rotor/propeller, without any long shafts involved. There was still a driveshaft along the wings for emergency use, to transfer power to the opposite rotor in case of engine failure. Launched in 1971 the XV-15 was to fly for the first time on May 3, 1977. The main problem engineers had to solve was designing an engine capable of operating horizontally but also vertically.The Avco Lycoming LTC1K-4K shaft turbines, modified T-53 turbine engines proved themselves reliable enough and by 1981 the XV-15 prototype was flying at major airshows, including the famous Paris Air Show. On 17 February 1983 the Bell Boeing team submitted a proposal for an enlarged version of the Bell XV-15 prototype for the Joint-service Vertical take-off/landing Experimental (JVX) aircraft program. Ultimately, this would lead the Bell Boeing team to the development of the world’s first tiltrotor to enter service. 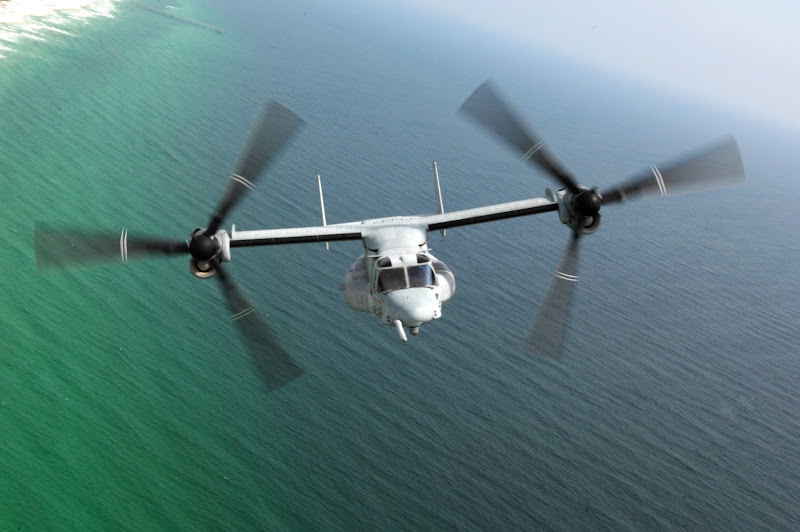 The JVX aircraft was designated “V-22 Osprey” on 15 January 1985. Six prototypes were built, the first flying on 19 March 1989 in the helicopter mode and on 14 September 1989 as a fixed-wing plane. There were a few setbacks on the way, prototypes number 4 and 5 crashed in 1990 and 1991. 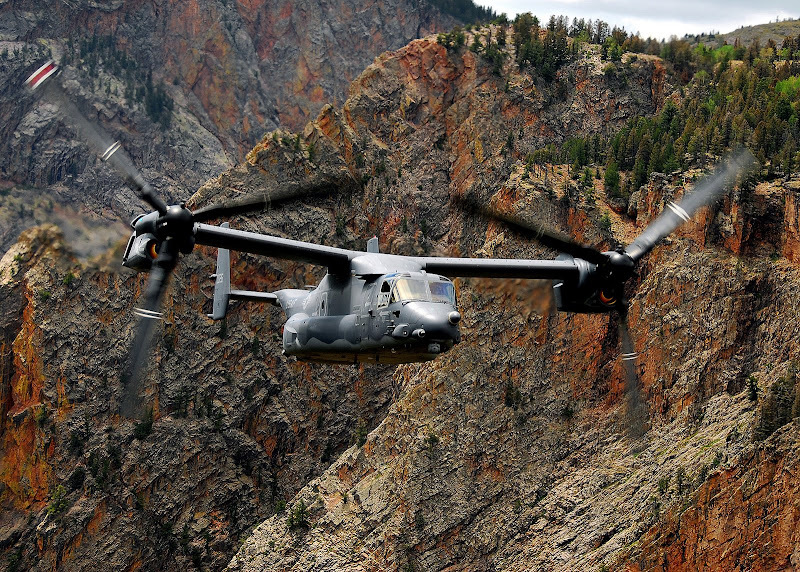 The V-22 completed its final operational evaluation in June 2005. The evaluation was deemed successful; events included long range deployments, high altitude, desert and shipboard operations. It was claimed that the problems identified in various accidents had been addressed by the V-22 program office. On 28 September 2005, the Pentagon formally approved full-rate production for the V-22. A total of 458 V-22s are expected to be built for the U.S. Marine Corps, U.S. Air Force and U.S. Navy. Although initially the JVX program had a budget of $2.5 billion, by 1988 the budget reached the $30 billion mark and there were many who argued for the termination of the program. Still, work was continued and by 2007, after $20 billion were spent for research and development, it was estimated that a further $35 billion will be needed before the program is completed. This is the most important aspect of the Ospreys development, a fact that remains controversial to this day: was there really a need for such an aircraft? 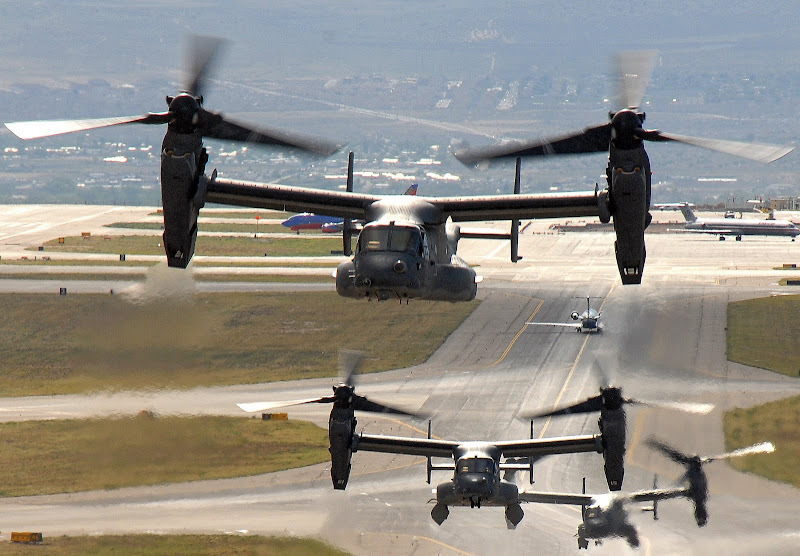 The V-22 Osprey will essentially be flown by the U.S. Marine Corp; they ordered 360 aircraft, the U.S. Air Force will receive 50 and the U.S. Navy 48. 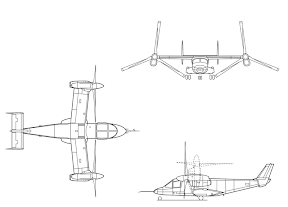 Whether the tiltrotor design will prove to rise to the expectations remains to be seen, as for now it is still too early to say for certain. As of July 2008, the V-22 had flown 3,000 sorties totaling 5,200 hours in Iraq with no major incident. I think that the further development of the original German Zeppelins is a very good way to improve the easy transport of several goods and people. In a forum (http://wetenschapsforum.nl) I discussed about the form (modelling)and moving of an airship and supposed a discus-model with turbo or turbo-props at the circular side. Is this system also usable for landing-meanings on planets? Too much money has been invested for this specialized air craft to sit in the garage. It’s the first of it’s kind there will be problems. All new craft have “gremlins”. The Marine corps need a state of the art mobile combat craft. They need to replace the aging ch-53 and ch-47. I think it’s pathetic to fly into battle with out dated weapon systems. risk? what about the beat up 20 year old helos are troops are fighting in? We still using vietnam erra equipment that drop out of the sky. If the gov stop being cheap and defense contractes stop trying to rip off the gov then we might have a decent weapons system. Hi I reach your site by mistake when i was searching bing for this wii issue, I must say your site is really helpful I also love the design, its amazing!. I dont have that much time to read all your post at the moment but I have bookmarked your site and also signed up for your RSS feeds. I will be back in a day or two. thanks for a great site. Airlines should just realize that they can’t dangle this “incentive” or “reward” before you and have you snapped at it like a hungry animal, I didn’t feel any gratitude to the airline in the end. Great website you have there, mate. Fantastic for Aircraft Lovers especially Warbirds! I’ve allways liked Ospreys. It’d be cool to get more into servious. because this time i aam reading this wonderful educational article here at my residence. They have been made 43 queries to database.